The 2s: All play and no work makes Jane a lifelong learner. For two-year-olds, their play is their work. It’s how they experiment and problem solve. Before they possess the necessary language skills to express the breadth and depth of their ideas verbally, they can express them through various forms of play (dramatic, imaginary or physical). As they grow beyond the 2s, play remains an essential way for our students to interact with each other and make sense of the world around them. Young children use language for a wide variety of purposes--to ask questions, share information, make comments, express emotions and solve conflicts. Also, children at this age simply play with language and sounds. In the 2s, language is developed in the children’s daily engagement with the materials and in their many interactions with each others and teachers. The early childhood classrooms are equipped with basic materials through which the children can express and give form to their ideas. The materials for 2s include (but are not limited to) blocks, paint, water and clay. These open-ended materials can be used in a variety of ways. 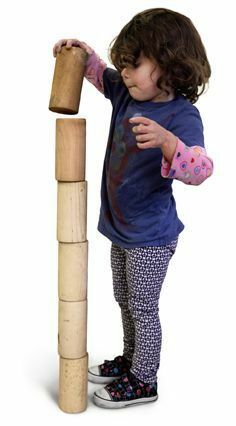 Each material provides opportunities for experimentation and discovery, and each allows for challenges that address individual children's particular skills and interests. The basic materials also address the diverse sensorial needs of children, from the dependable solidity of blocks to the delightful pliability of clay. The materials can all be used in social as well as solitary ways. Indoor Blocks: 2s begin the year exploring the different blocks and their qualities. They experiment with concepts of balance and weight in their constructions and use the blocks to explore patterning and design concepts. The blocks are all fractional units of each other and the 2s begin to explore these relationships. Through use, the 2s begin to internalize these concepts and continue to explore the material as they problem solve. Children also begin to use the blocks as a forum for dramatic play. Paint: Paint is one of the basic work materials, available in the primary colors. The omission of the secondary colors allows children to create these colors on their own. At the easels or worktables, the children explore color mixing with and without intention with a wide variety of brushstrokes. 2s are often more interested in the process than product when painting. They may begin with one shape and continue to paint over it to explore a new shape, image or color. Paint may be used to express a feeling or thought, to create designs, or to tell a story. 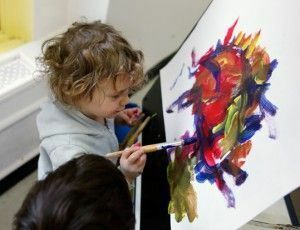 Children may use paint as both a physical and emotional release. Water: Working with water offers an inviting and familiar experience for young children. The 2s explore and experiment with the properties of water, using the accessories provided. They practice pouring from a variety of containers and funnels. They also engage in dramatic play—washing babies, cooking food, etc. The water table can be a place for social interaction, as well as a place for solo work and making observations. Clay: Clay is available to children during their indoor work time. Clay gives young children a tactile sensory experience. It records and holds form as children manipulate it. They use their hands to pound, roll, pull, spread and pinch the clay. There is a lot of exploration and experimentation with this medium. Clay provides many opportunities for socializing, as children share stories and techniques for working with the material, pretend to cook or blast off for the moon, or just enjoy chatting while they are pounding or pinching the clay. Using their hands as tools strengthens children's fine motor skills. Touching the clay with their fingers also allows children to benefit from the cool, soothing feel of the material. Books: The 2s classrooms are stocked with books that reflect the children’s interests and life experiences. These books are available to the children during their indoor work time. 2s are encouraged to look at books independently or with a partner. There is also a story time every day when the whole Group listens as a teacher reads aloud. Music is incorporated throughout the 2s’ school day to aid in transitions. Specific songs with instructional words are used to gather children for various group activities. In addition, the 2s have a group song time daily. The school year begins by singing traditional children’s songs with which the children are familiar. New songs are introduced over time and eventually each child gets to choose a song for the Group to sing each day. A variety of songs are sung: songs to be sung while sitting down, songs that incorporate whole-body movements, finger-play songs, songs in different languages and counting songs. The 2s keep rhythm by tapping on their legs and/or clapping with their hands. Learning about the world in which they live is a natural interest of young children. As the year progresses in the 2s, the focus is on coming to know the City and Country community. 2s take trips in both small and whole groups to other parts of the School including classrooms, the Library, School Store, Post Office and Kitchen. The 2s have an outdoor time every day except in rainy or extreme weather. The 2s’ Yard is equipped with wooden boards, blocks, large boxes, a climber and a slide. The equipment supports the children’s physical growth in numerous ways. The materials are specifically designed to allow the children to challenge themselves physically, learn to take risks and develop a sense of what feels safe. A sandbox and accessories are also available to the children each day. The environment in and around the Yard—for example, leaves, pebbles and the sky—is also an important part of the 2s’ outdoor experience.